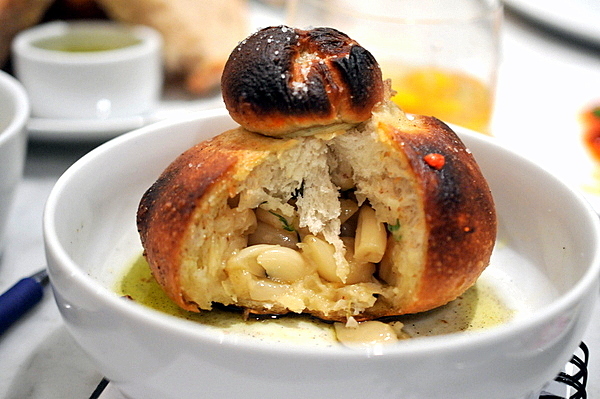 I first met Jet Tila during Bistronomics 2.0, a collaboarative pop-up between Tila and Alex Agneau. An LA native, Tila got started in food early working at his family's Bangkok Market. 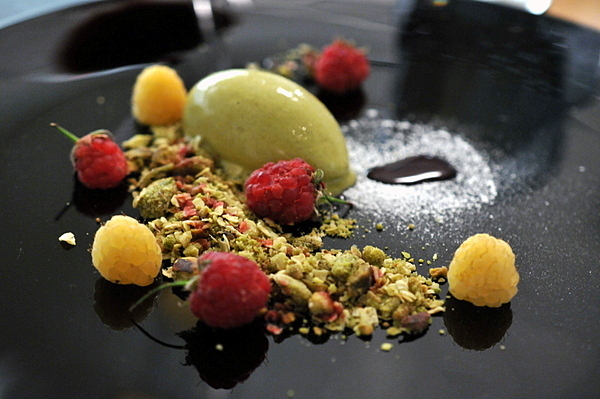 His formal training took place at Le Cordon Bleu and his resume includes stops at Patina and Grace. In 2008, Tila was tapped to head Wazuzu, a pan-Asian restaurant at Steve Wynn's Encore. 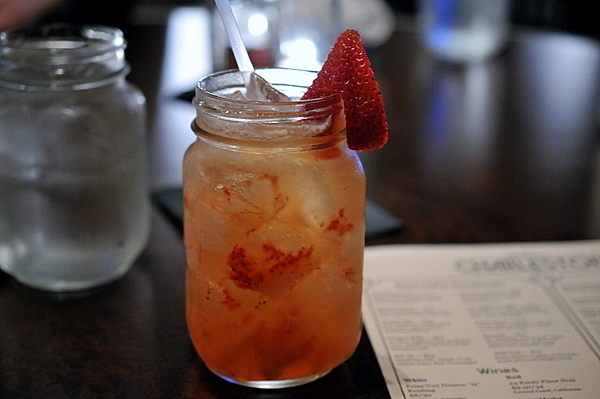 The Charleston marks Tila's return to the Southland, a gastrolounge that offers American comfort food and nightly live entertainment. Jet was kind enough to invite KevinEats who brought me along to sample what The Charleston had to offer. We ordered a round of cocktails while perusing the menu. 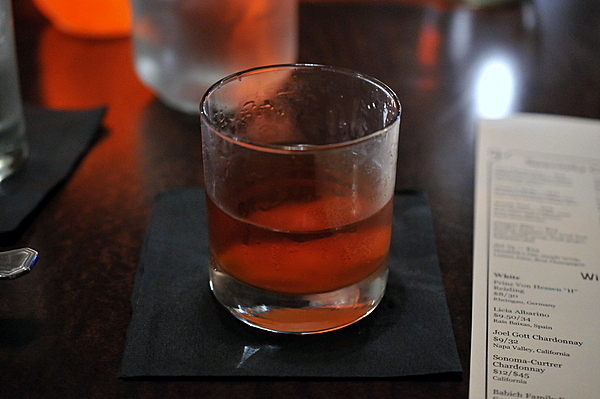 I opted for a classic sazerac, the strong woody backbone of the whisky is readily apparent though tinged with an herbaceousness from the bitters and absinthe. 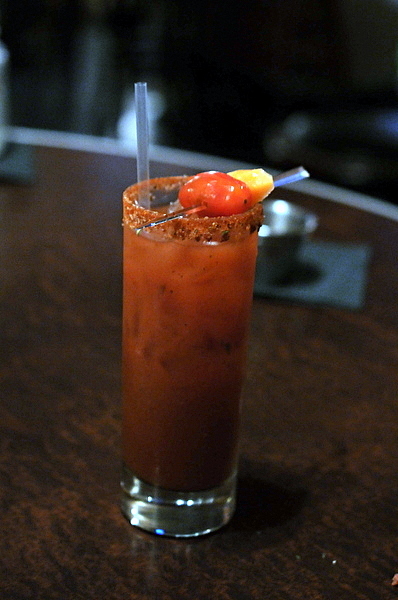 The Victoria's Secret, named for the bartender who created it, was much sweeter, masking a hefty slug of tequila under a mash of strawberries and lime. 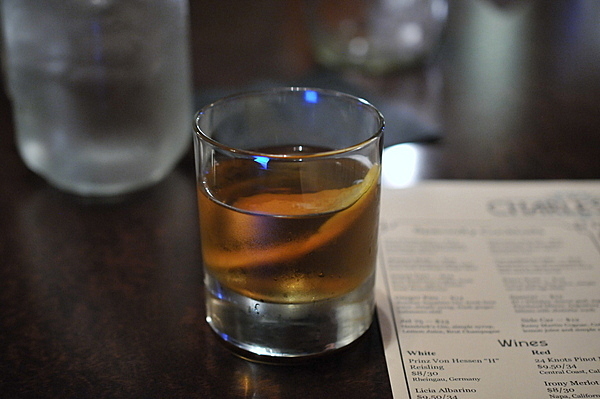 The signature Charleston was the strongest of the three, more tempered than the sazerac, there was still some heat from the whiskey but balanced by a floral citrus note. Everything is better when coated in batter and fried right? In this case the answer is a qualified yes. I enjoyed the crisp exterior and smoky essence of bacon, but I was hoping for a bit more cheese. The marinara elevated the dish substantially, with the cool tang counterbalancing the weight of the fritter. 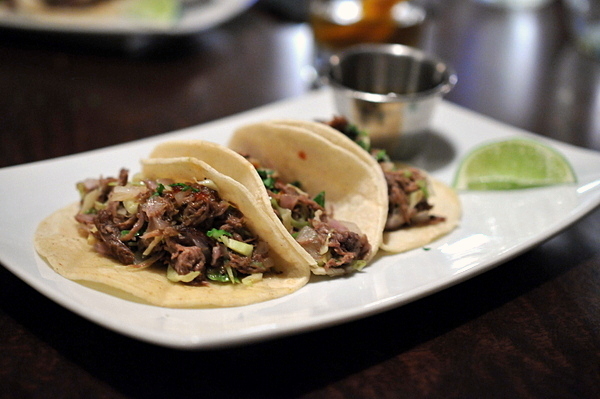 Though Kalbi tacos might seem a bit played out, this was actually one of the strongest dishes of the night. The succulent short rib has a lusty note of pure meaty verve seasoned with a subtle KBBQ spicy-sweetness. The side of sauce added a bit of extra heat but I preferred the unadulterated meatiness of the taco sans sauce. 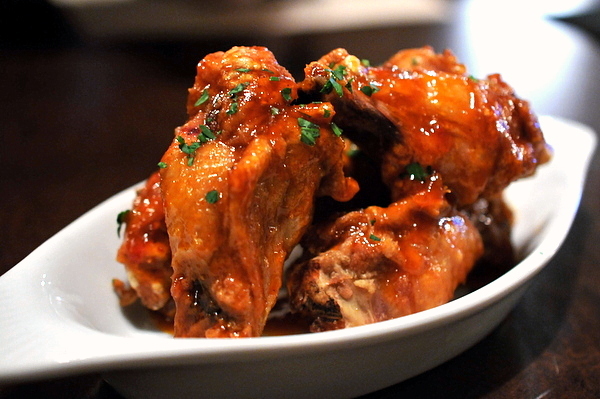 What gastrolounge menu would be complete without some form of fried chicken wing. The nicely fried drumettes live up to their name with a slow creeping heat and a sweetness. 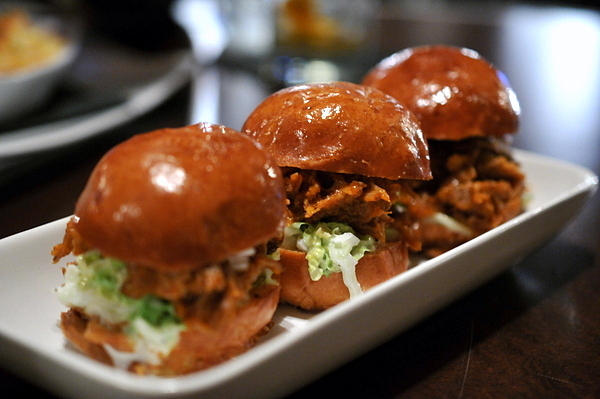 Like the tacos, the sliders really deliver a strong meaty flavor. A sharp tang kicks things off leading into a rich porcine sapor that plays beautifully with the slaw's chilling succulence. 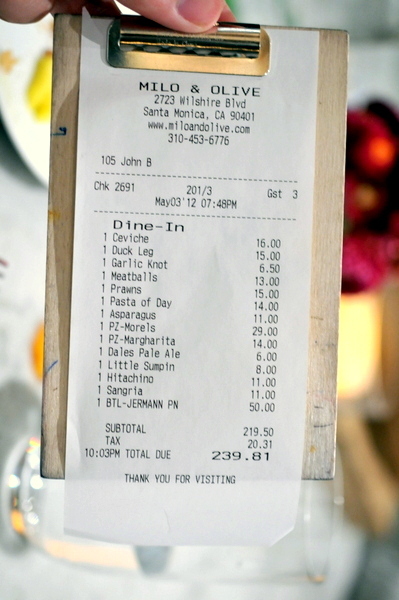 Around this point we stopped ordering and just let Jet work his magic and serve us whatever he felt like. 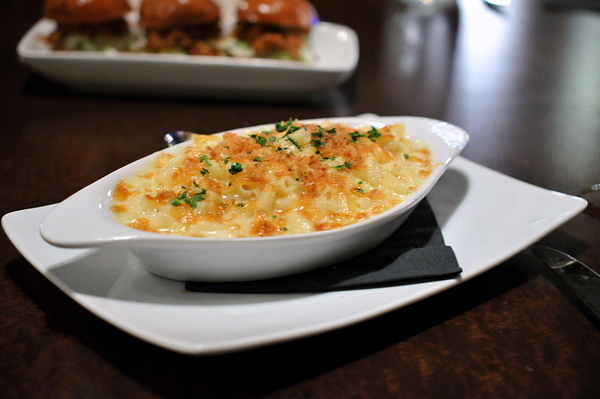 It was nice to compare the earlier bites to a proper mac & cheese. 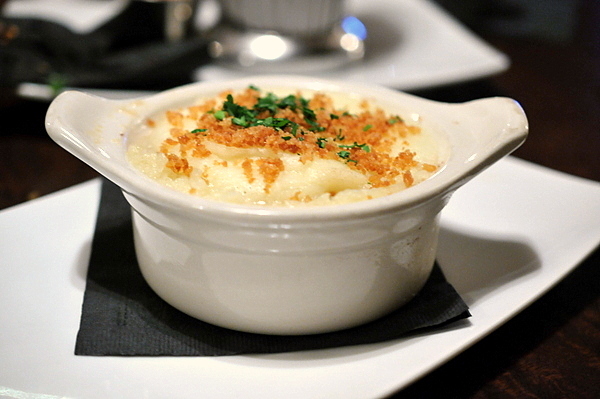 This had the creamy velvety texture of a well-executed mac and cheese. 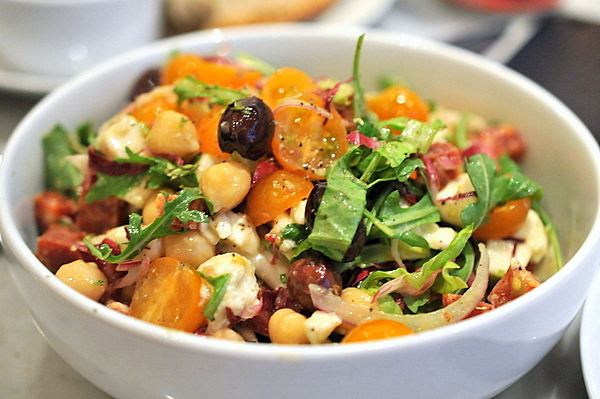 With fewer adornments, the flavor of the cheese is also more readily apparent in this dish. 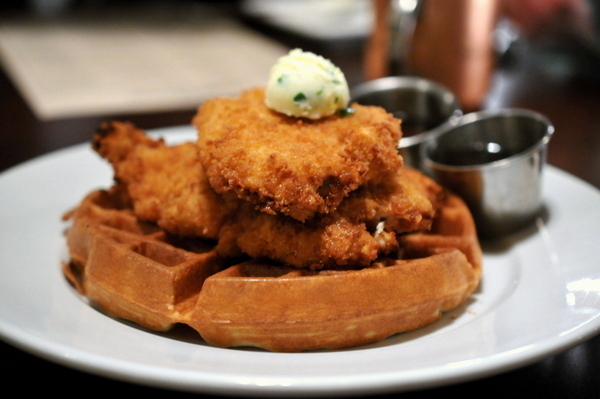 Chicken n' waffles is one of those must-order things on any menu. 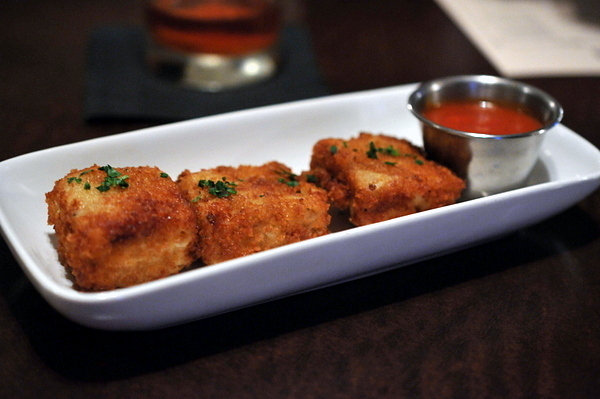 The juicy tender chicken came lightly seasoned with a mixed panko and traditional breadcrumb batter. The dense Belgian waffle soaked up the maple and gushed sugary sweet goodness with each bite. Our next trio of cocktails consisted of three classic cocktails. 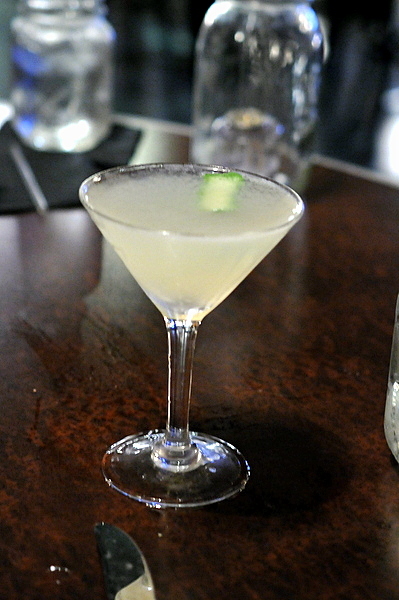 The Jet 75 a riff on the French 75, same ingredients but a bit more cucumber. 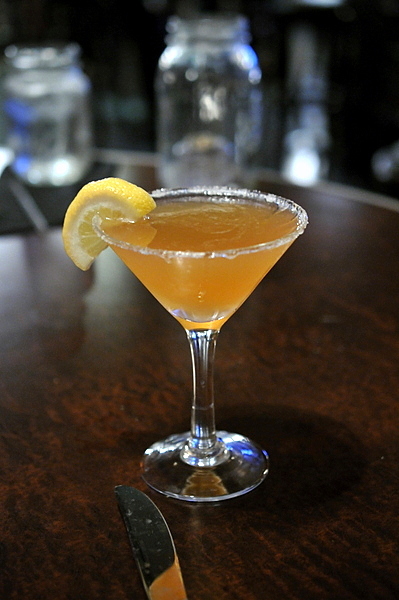 The side car was fairly prototypical, an adult orange juice with a slow smooth burn. 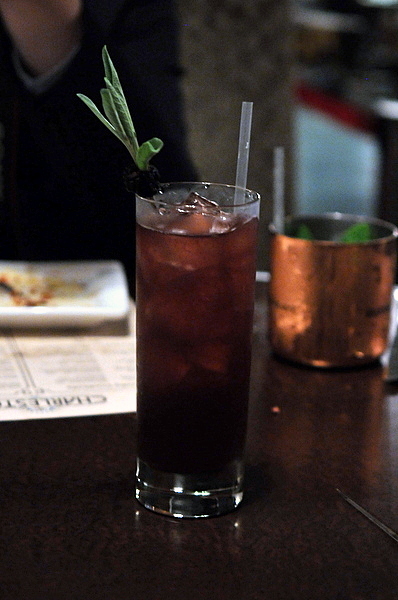 The final cocktail was my favorite of this round, blending vodka and citrus with a bracing kick from the ginger beer. Had it been up to us we probably would have gone with the bacon, egg, and cheese flatbread but this wasn't a bad choice either. 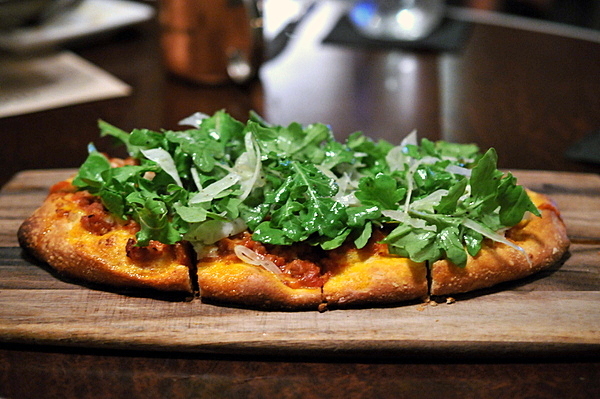 Despite the mound of green, the flatbread ended up being fairly heavy with the greasy salinity of the sausage coming through cleanly. 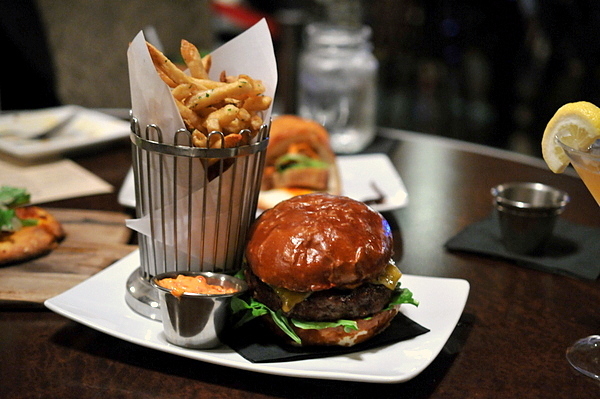 I typically like my burger on the complex side so I was surprised how much I enjoyed this burger. The robust meaty heft of the patty more than made up for the simplicity while the few adornments were all selected with the goal of elevating the meat without overshadowing it. Pork filled donut, nuff said. 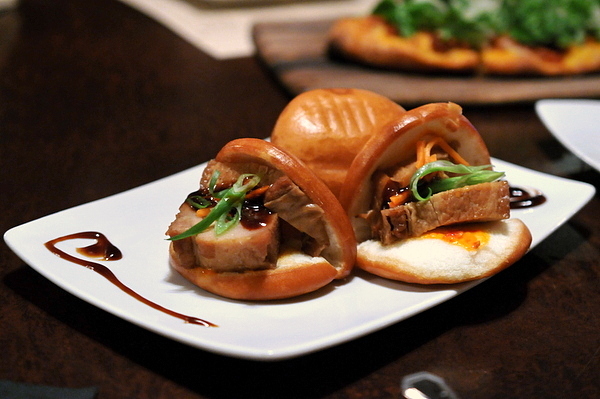 Jet caramelized the steamed buns then stuffs each with a generous serving of pork and shredded pickled vegetables; the sugary crunch of the bao complimenting the unctuous belly and piquant veggies. 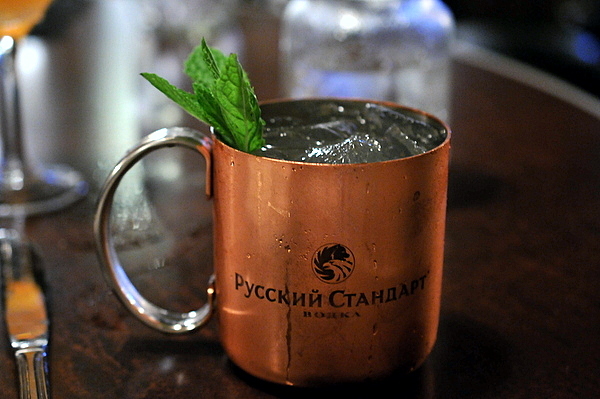 For our last round we had the resident mixologist serve us some of his specials. Though I'm not a huge fan of Bloody Mary, but this was pretty tasty savory with well-defined elements instead of the typical V8 flavor I normally associate with the drink. The chorizo Manhattan was surprisingly smooth, the alcohol tempering the flavor of the meat while the fat from the sausage rounded out the drink with a buttery nuance. 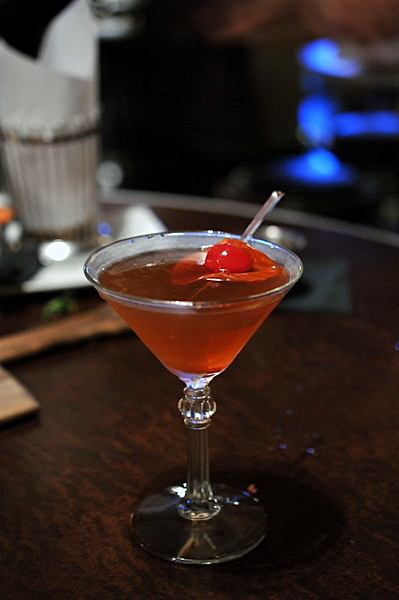 The last drink was also named for a member of the staff; built around a core of smooth Jameson with a piquant funk from the balsamic and a countervailing sweetness from the honey. While this sounded like a good idea at the start of the meal, the blend of shredded shortrib and creamy potato made for a tasty but ultra-heavy mixture that felt a bit overwhelming. 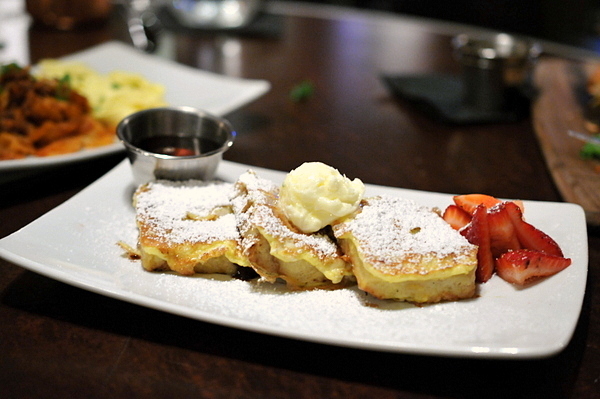 For our last two dishes we decided to pick things off the brunch menu. 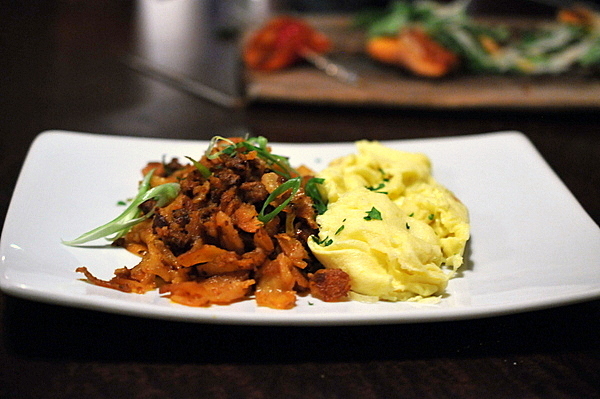 First up was a chorizo hash, the classic brunch repast pairs fried potato and bits of savory sausage with a side of fluffy scrambled eggs. Our "dessert" was another dish off the brunch menu, a dense sweet bread pudding augmented with a light savor. I came to Charleston expecting yet another gastropub, but Tila adds enough idiosyncracies and personal touches to make the menu his own. Despite being dubbed "American comfort food" the touches of Asian flair feel fitting given Tila's experience and training but there are enough classic dishes that their inclusion doesn't feel forced. Overall the food is well executed and enjoyable with the standouts being the tacos, bao, and burger. I'd rate trying to score a last minute brunch reservation on Mother's Day an endeavor only slightly easier than finding water on Mars. So whats a slacker to do? In my case, I thought something unconventional like sushi might be more feasible. Even this proved to be a bit harder than I expected since most sushi restaurants only offer lunch on weekdays. I was originally planning a trip to Sushi Go 55 when my friend told me about this new restaurant, Shunka, that opened three months ago in Costa Mesa. There were two chefs at Shunka; the owner Yuki who previously worked at Matsu in Huntington Beach and our itamae for the day, an older gentleman named Shin. Right out the of the gate the meal got off to a good start. 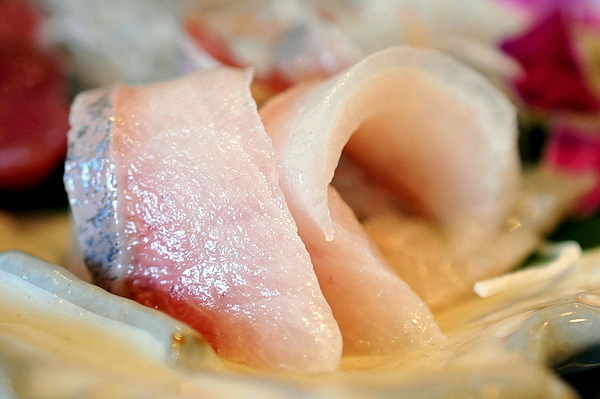 The amberjack exhibited a luscious jellied snap and a note of clean fish oils. 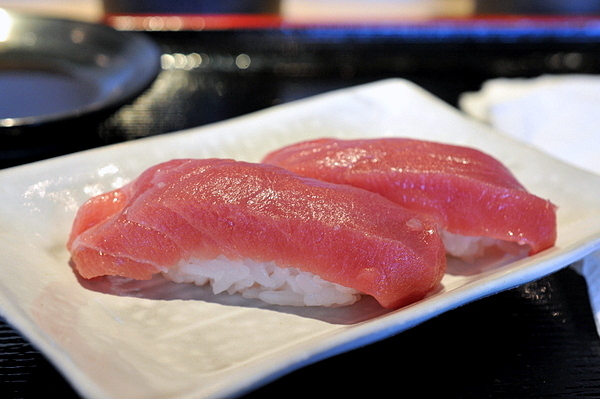 The toro was immensely soft and porous almost like chewing on a fish marshmallow saturated with rich fatty goodness. The ankimo was the weakest of the three, conveying only a faint offaly tinge and with a dense meaty texture rather than the creamier mouthfeel that I was hoping for. 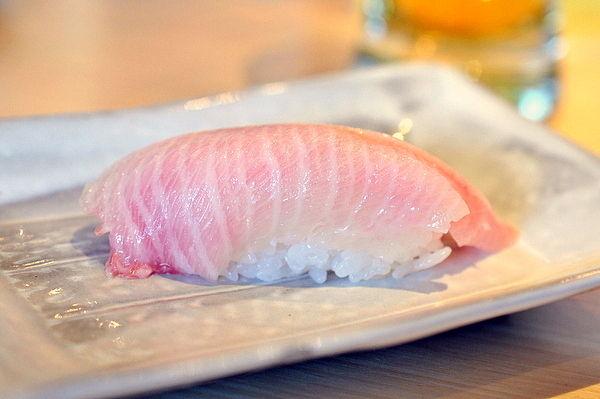 Shima Aji has always been one of my favorite fishes and though this piece was enjoyable it lacked the ethereal slickness and the multifaceted flavor profiles that enchanted me previously. 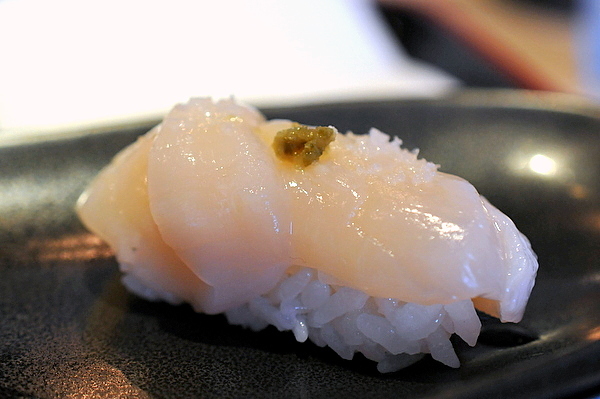 Here we have a fairly classic scallop presented with salt and yuzu kocho. 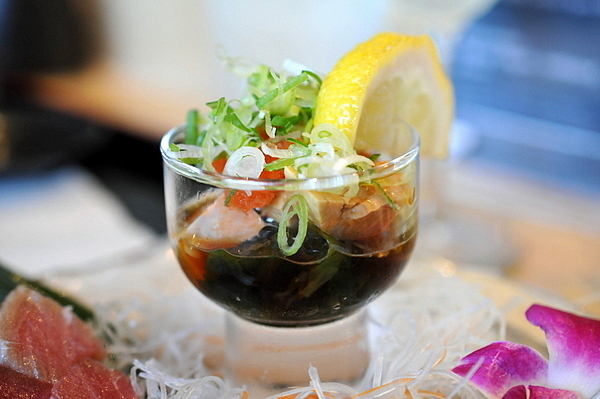 The former helps to balance the sweetness of the shellfish while the latter adds a lively piquant bite. 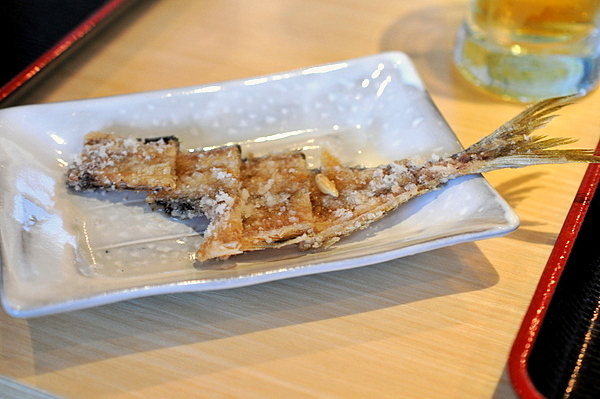 I've only had deep fried mackerel bones on a couple of other occasions and it's always a treat. 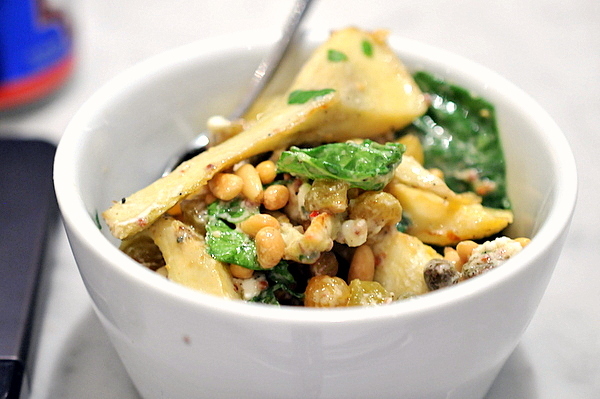 The bones have a crisp chip-like texture and robust savor. This preparation came covered in lemon which gave the morsels a nice tang and seemed to draw out an undercurrent of mackerel essence from the bones. 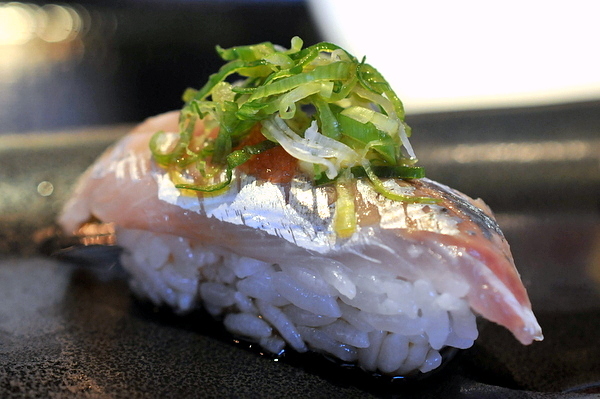 Saba tends to be one of the oilier mackerel varieties, but Shin counters that by topping the fish with a piece of marinated kombu. The overt sweetness of the seaweed balances the fish on the attack while the sweetness of the rice takes over on the finish. The white bands of marbling on the belly stands out in stark contrast to the pink flesh. Unsurprisingly the texture is tender to the point of being gelatinous while a heady oiliness seemed to emanate from the flesh with each bite. At this point Shin asked if there was anything else we wanted. Naturally I requested an order of sea urchin as well whatever else Shin saw fit to serve. 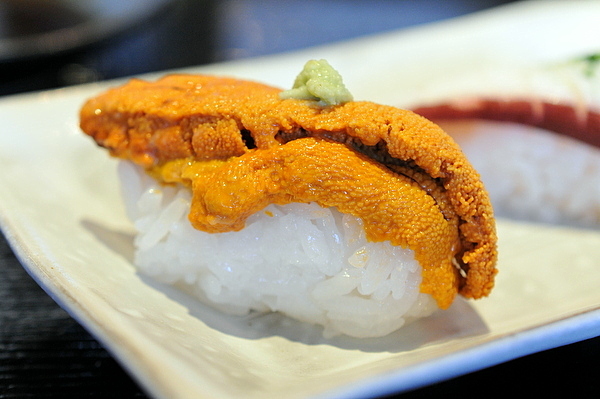 The uni had a bracing creamy texture but was a touch on the salty side, though the sweetness of the rice was an effective substitute. 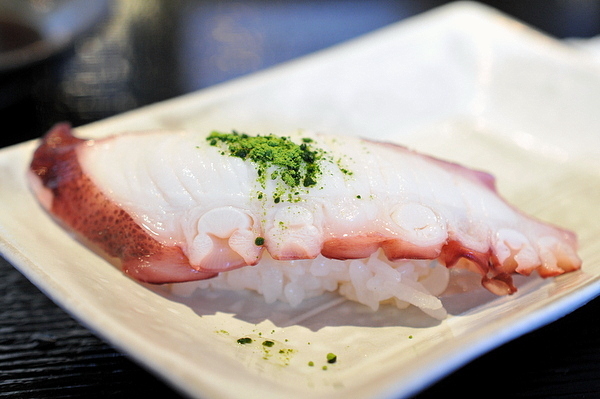 The octopus proved to be one of the strongest piece of sushi. The texture is dense and delightfully toothsome while the matcha salt provides a unique subtly bitter salinity. 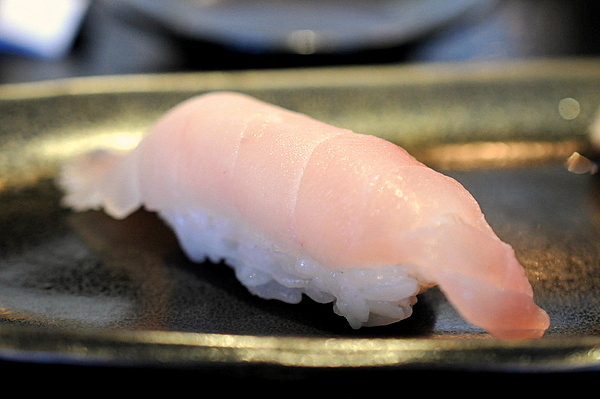 I've always enjoyed Kurodai, the fish has the mild flavor of a sea breem but a texture and richness that suggest a much higher fat content than the more common tai. 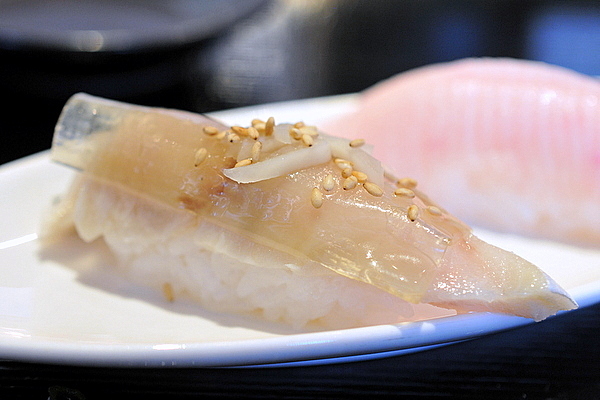 It felt kind of strange to finish with the bluefin but the fish itself was faultless; completely tendon free with mild flavor and a delicate fragrance of the ocean. 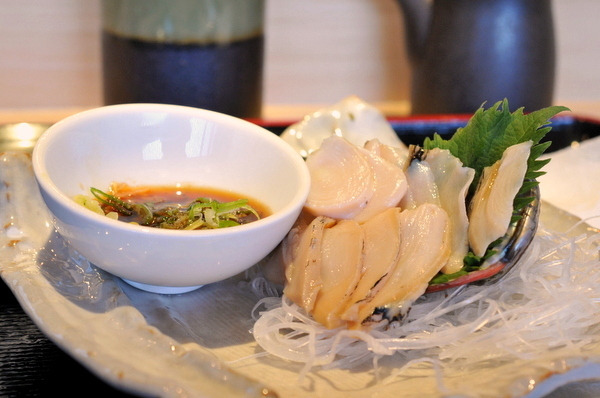 Shin's last offering was a whole abalone. 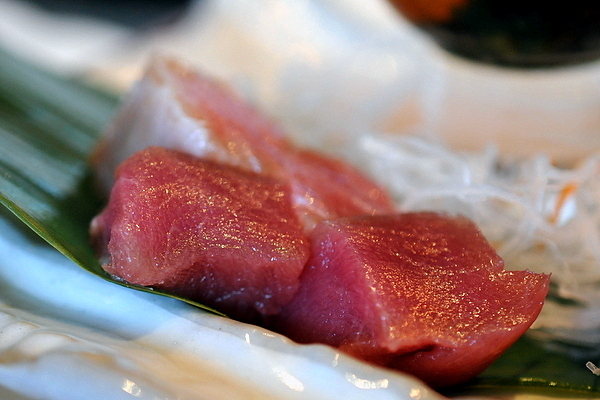 The meat was cut into thin slices of sweet snappy sashimi while the liver was served in vinegar soy mixture that tempered the organ's bitterness leaving it with a trace of foie like richness. Overall I'd rate the place a touch behind Ohshima and Nana-san in terms of overall quality. The fish was very good across the board, though the selection was a bit limited. Likewise the rice was solid with perfect density though its strong sweetness tended to overwhelm the fish on the finish. 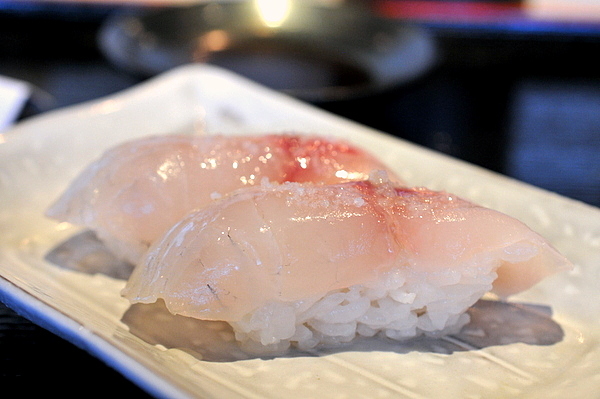 All in all, a strong addition to the sushi scene in Orange County and one well worth trying. With the impending ban of foie gras less than two months away, it was inevitable that chefs throughout the state would mourn its loss the only way they can, by celebrating the ingredients in the time left. We've already seen the "Two Dudes" from Animal, Jon Shook and Vinny Dotolo, for an all foie collaboration back in October of 2011 with Ludo Lefebvre who hosted a solo best of foie gras dinner about a month ago. In the same vein, Melissé unveiled an eight course foie gras menu that they will serve until the ban takes effect and I can only imagine the events getting more extravagant as the dreaded date draws nearer. Tonight we have the most ambitious yet, a Nor Cal vs So Cal Foie Gras Battle dubbed "The Whole Duck" taking place across multiple restaurants. C.H.E.F.S., the Coalition for Humane and Ethical Farming Standards, along with Los Angeles’ leading restaurants: Mélisse, The Royce at The Langham, Patina and Animal, will simultaneously host a six-course prix fixe dinner to support sustainable farming practices and "the whole duck." 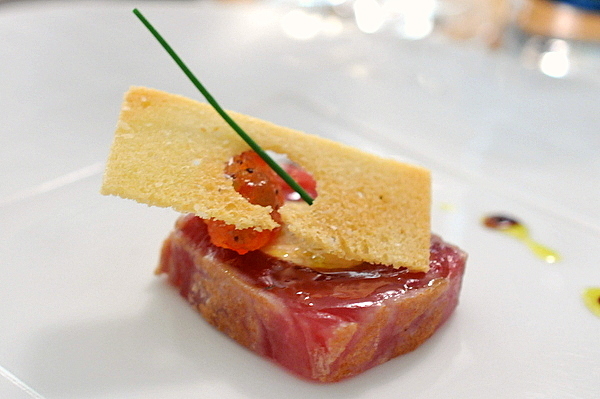 The battle for foie gras will feature esteemed chefs at each of the participating restaurants working side-by-side. Chef Feau has always taken care of us when we drop by his restaurant and tonight would be no different. 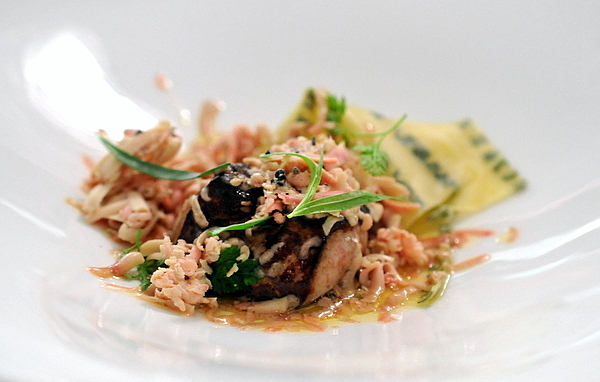 A relatively straightforward foie preparation, Feau referred to this as his take on a chilled seared foie gras. 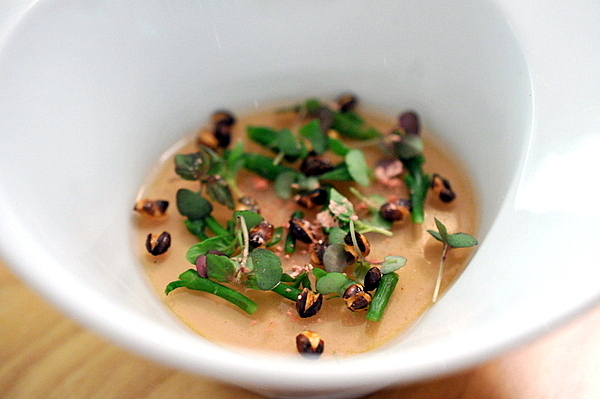 I loved the textural interplay from the duet of duck liver. The chilled foie was delicious with the bitter and sweet accompaniments or spread on the smoky crusty roll made with the last winter truffles of the season. The meal proper began with a slightly airy foie gras covered by a gelatin made from sake, mirin and cherry blossoms which gave the parfait a delicate floral character. The gelatin and parfait melt quickly on the palate forming an umami liquid foie gras while the sea beans and toasted barley give the dish a nice saltiness as well as a lively crunch. This was easily one of the strongest dishes of the night thanks to the sublime finesse and balance of the foie with its various accoutrements. The custard conveys a subtle essence of essence of richness that underpins rather than overpowers the rest of the plate. Likewise the keen smoky heft of the sturgeon, malty crunch of the rye "earth," and multifaceted vegetables all contribute integral facets to the dish. Despite being better known for his seafood, Cimarusti makes one of the more better warm foie gras presentations that I've had recently. Plated with a contemporary flair, the foie rests on a bed of strawberries that perfume the foie but without feeling cloying. 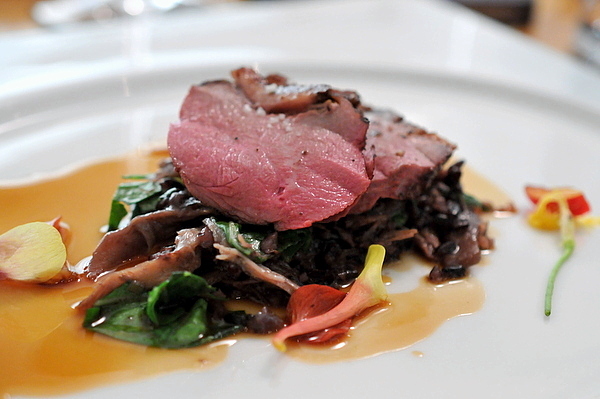 Up to this point, I hadn't seen much of the "whole duck" aspect of the meal but Chef Scargle's dish was clearly more about the duck's meat than its liver. 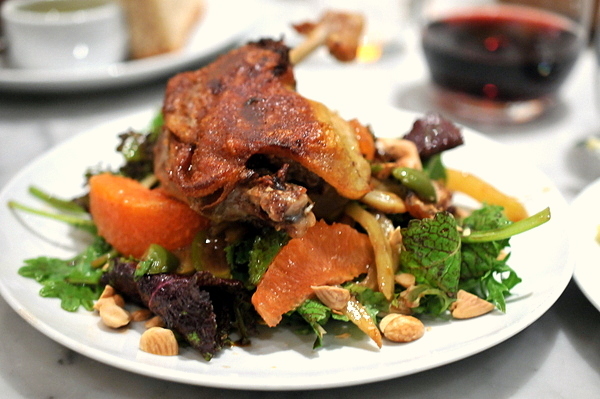 The confit shows the distinctive flavor of five spice while the breast has a more muscular texture and crisp savory skin. The foie is only present in a subtle sweetness in the "risotto"
Last but certainly not least, we have our dish from the evening's host, Chef David Feau. In a night of distinctive foie gras presentations this one might take the cake. 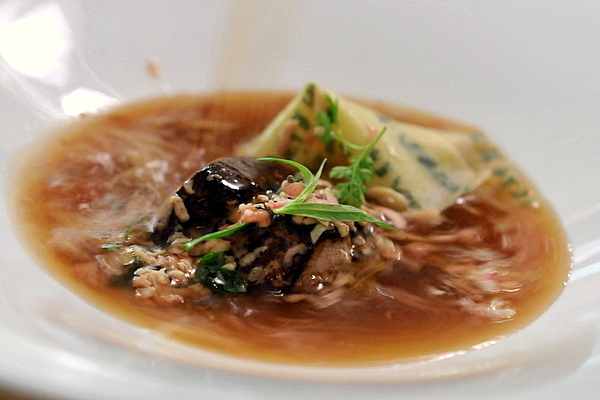 Foie shavings are melted by a broth made from dry aged beef and the resulting mixture demonstrates a clean beefy power as well as a seductive weight from the fondue. 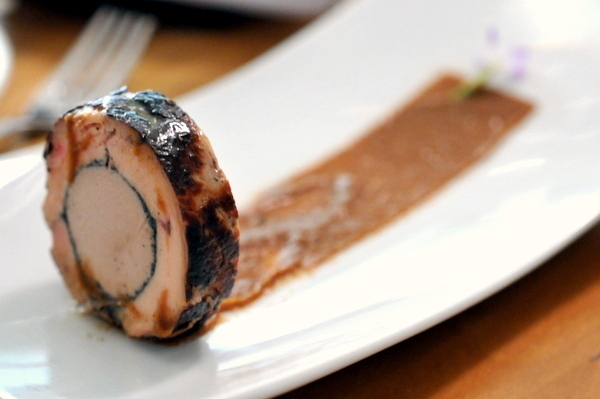 Personally, I found the lobe of foie unnecessary as the shaved bits we enough to convey the liver's offal-y richness. Pity there weren't any protesters at The Royce, they may have appreciated this course. The granola is seasoned with the distinctive flavor of pistachio while the sorrel adds a verdant creamy sweetness but doesn't overpower the wholesome nuttiness of the pistachiola. 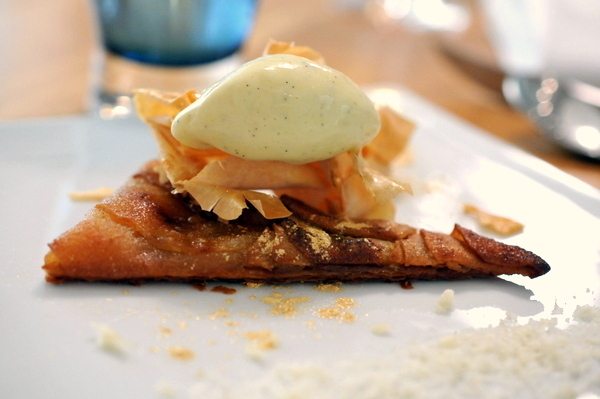 The final course of the night was a delightfully complex apple tart. The airy crunch of the phyllo contrasts with the dense buttery crust of the tart. The sugary flavor of the cooked apple and ice cream are fairly traditional but the savory funk of the Roquefort makes both flavors shine. Though billed as a competition, the meal turned out to be more of a collaborative dinner. As always these events seem to bring out the best in those participating resulting in distinctive and unconventional preparations of foie gras. Feau mentioned the possibility of another dinner on June 30th, something my mouth is anticipating but my heart is dreading. Milo & Olive is the newest member in Josh Loeb and Zoe Nathan's growing portfolio of restaurants in Santa Monica; joining Rustic Canyon, Sweet Rose and Huckleberry. The restaurant offers a versatile combination of fresh baked pastries and artisanal pizzeria augmented with a seasonally based menu. Like its sibling restaurants, Milo & Olive seems to have gotten a strong local following as evidenced by the constant line of people waiting to sit down for dinner. I heard about the restaurant awhile back but I doubt that I'd have bothered to visit if Walter Manzke wasn't running the kitchen. 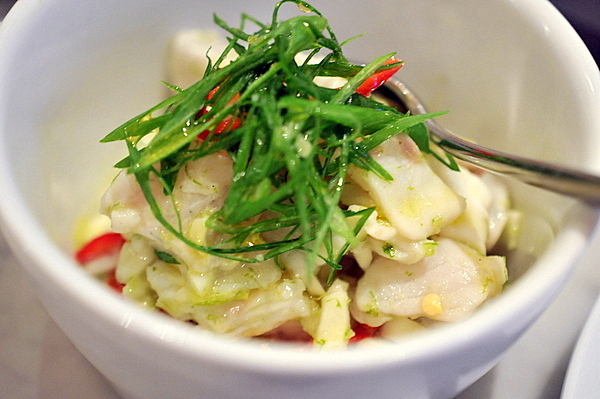 First up was a classic sea bass ceviche, the dense fleshy fish is seasoned with a marinade that presents a very balanced profile between the jalepeño and lime tinged with a delicate mintiness from the fennel heart. This was the first of many gifts the kitchen sent us. I tend to think of chopped salad as one of those tired appetizers every steakhouse has to serve, but this was actually surprisingly complex. The starchy heft of the chickpeas as well as the salty kick of the pepperoni helping to set the dish apart from the norm. Given how much Kevin and I loathe beets the only way would eat this dish was if it were free. 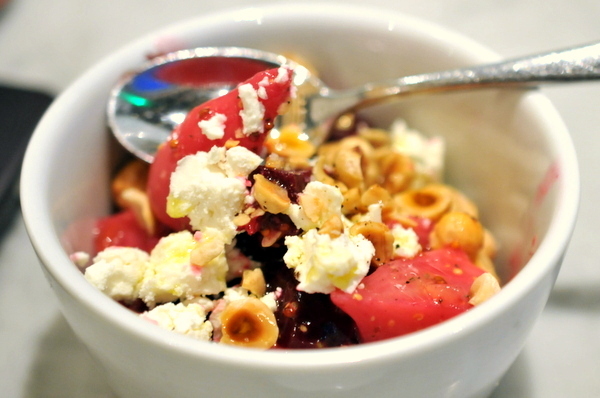 The dish actually proved to be pretty good; the sour twang of the cheese moderating the inherent sweetness of the beets. I enjoyed the char and salinity of the prawns but the texture was a touch rubbery. 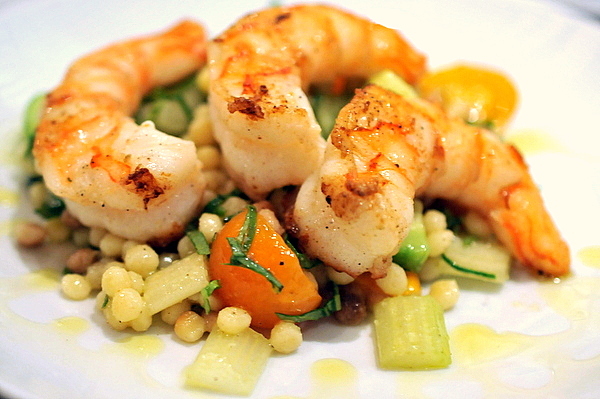 I liked the bright succulence of the vegetables and the toothsome chew of the fregula in contrast to the dull texture of the prawns. On the heels of the shrimp came one of my favorite dishes, and a vegetarian one at that. 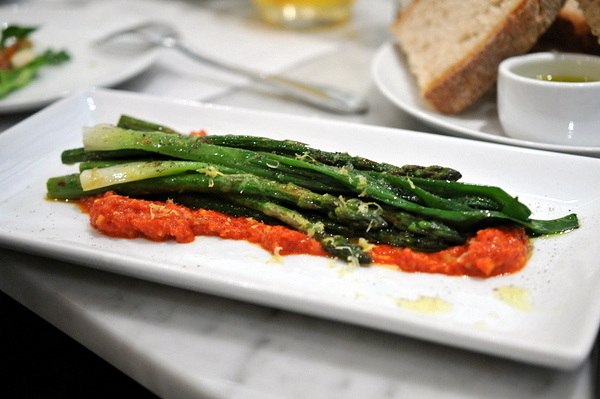 The asparagus and onion stalks were cooked to a melty tender texture and the sweet fragrance of the onion intertwined beautifully with the astringent flavor of the asparagus. The sauce adds a smoky rusticity and fitting weightiness to the vegetables. 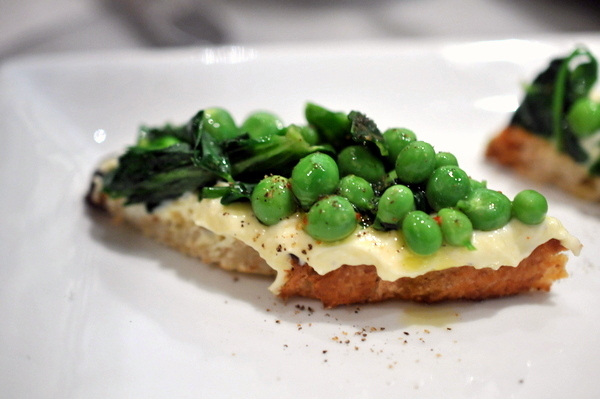 Another really stellar vegetarian course, the combination of peas and mint play off each other beautifully while the ricotta provides a creamy textural base for the vegetables. 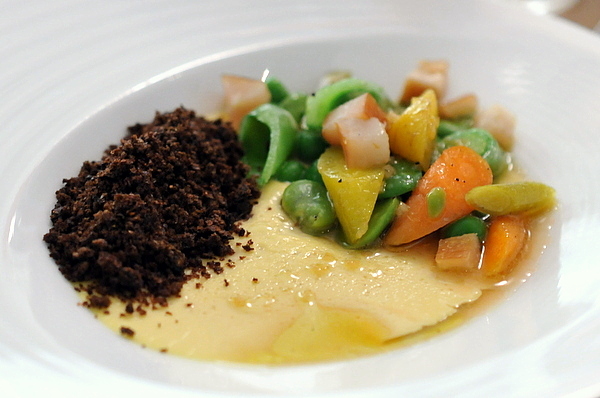 Like the beets, artichoke is something that I've never really enjoyed, but Manzke did a good job with this dish. The cheese and artichokes had a gentle tang but it was the robust flavor of the pine nuts and sugary raisins that stood out. 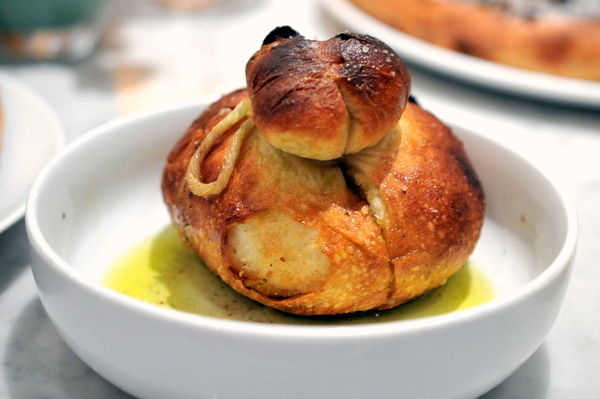 The garlic knot is considered Milo & Olive's signature dish. 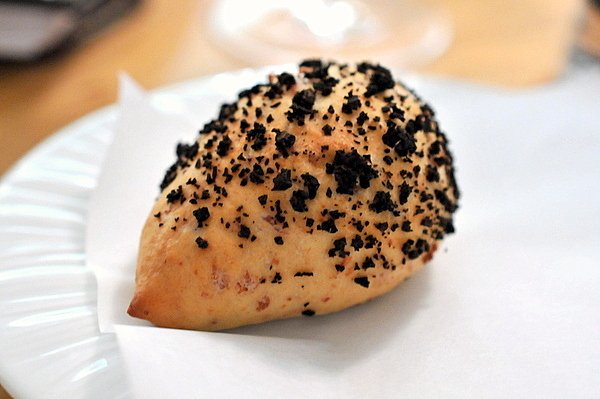 The hollowed shell of bitter toasty bread hides a bounty of soft garlic cloves. I thought the garlic would be overly intense, but the flavor was actually quite mellow. 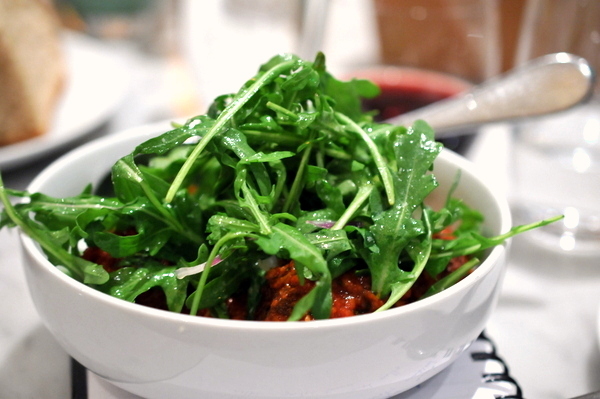 I hoped that the arugula would hold up but the nutty flavor was completely overwhelmed by the monolithic heartiness of the meatballs and tomato sauce. Tasty but overly simplistic. By this point my companions and I were already stuffed, but in a demonstration of sadistic generosity, the kitchen served up this gargantuan portion of pasta. 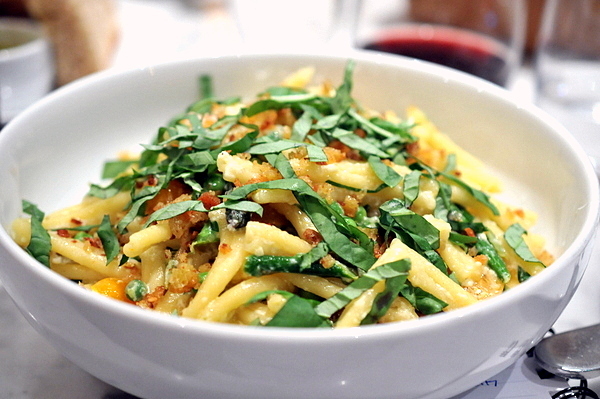 The pasta felt a bit overly firm but I actually enjoyed the mild creamy cheese with the bright melange of vegetables; particularly the ripe tomatoes and fragrant basil. The leg itself was falling-off-the-bone tender and the bird's savor is further augmented by a delectably crispy skin. The orange was a natural compliment though I found the honeyed sweetness of the dates a bit much. After a painful amount of food we finally get to the restaurant's specialty: the pizzas. The shrimp was yet another present. 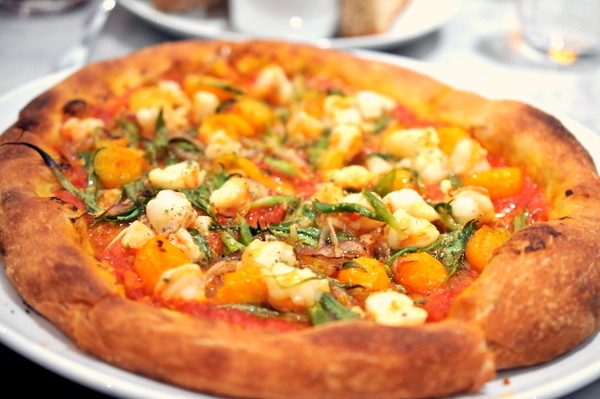 I liked the way the shellfish imparted a sweet salinity to the pizza, too bad they still felt a bit overdone for my tastes. The morel pizza was a seasonal special and we got the last one of the evening. 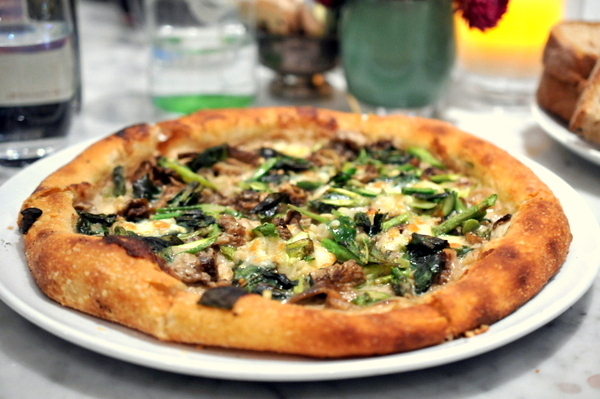 The earty bite of the mushrooms is complimented by a bitterness from the asparagus; easily the most robust and impressive of the three pizzas. 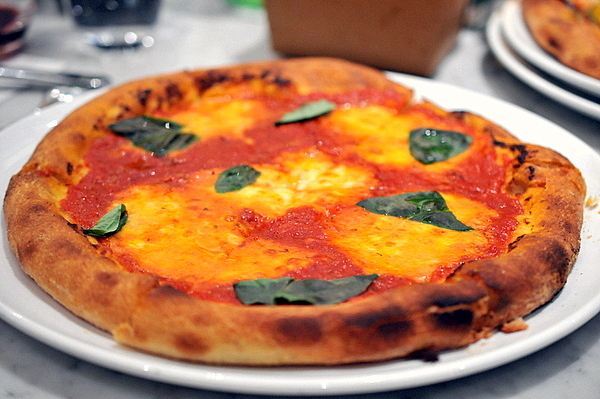 Margherita pizza often serves as a baseline when comparing pizzerias. While the flavors were spot on the crust wasn't quite what I was expecting. The crust lacked the expected bitterness and had a much more substantial crunch; an arguably more accessible combination than true Neopolitan pizza. 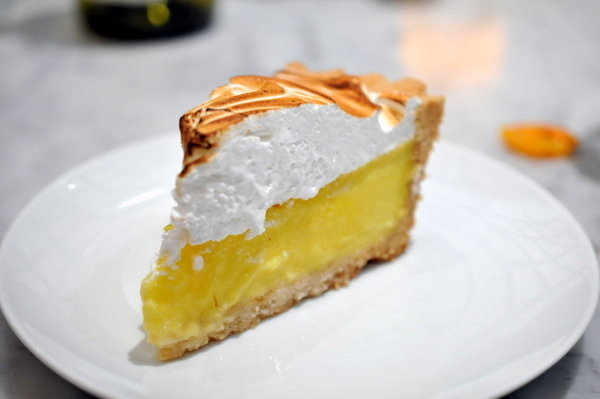 The pie was pretty classic, sweet creamy meringue, a bracing tang from the lemon and a heady buttery crust. Our server described this as a grown-up PopTart but I thought that was selling the dish short. 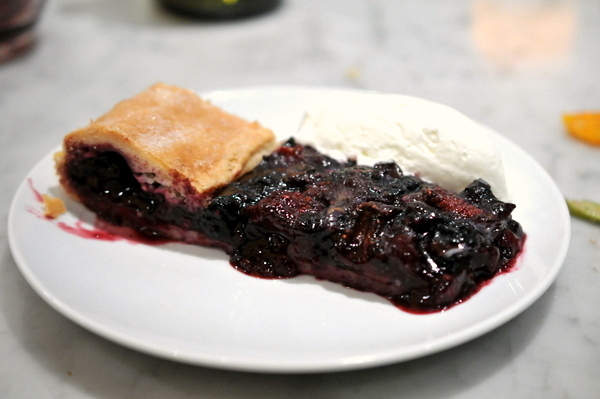 The combination of blueberry and blackberry made for an intensely jammy sweetness rendering the crust into more of a textural element. I ended up visiting Milo & Olive after other plans fell through and I came away satisfied. The restaurant offers something for everyone, whether that's a fresh baked pastry for breakfast or a hearty bowl of pasta for dinner. 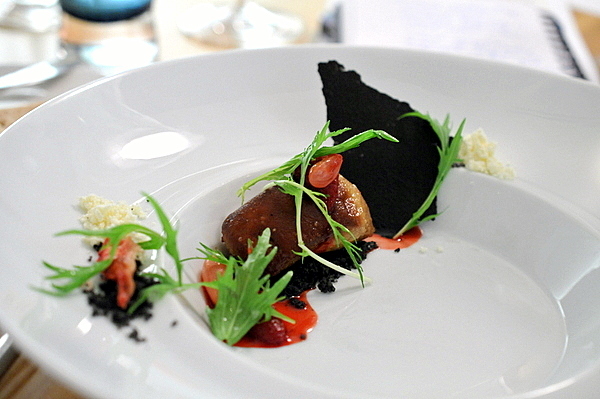 The basic well executed fare was enjoyable but felt a bit simplistic for a chef of Manzke's talents.